KawaiiPunk - Kawaii Mascot Blog: KawaiiPunk Christmas Party 2011! Great news, readers, it’s party time! And I’m not just talking about any old party! I’m talking about the annual KawaiiPunk Christmas Party! Yippee! But what did you do this year, I hear you all eagerly ask! Well, after the success of the 2009 hill walking party, not to mention the joy of the 2010 hill walking party, I decided that 2011 needed to be something really special. Can you guess what that was? That’s right, I decided to treat my colleagues to another incredible hill walking party! And, oh boy, didn’t they just love it! 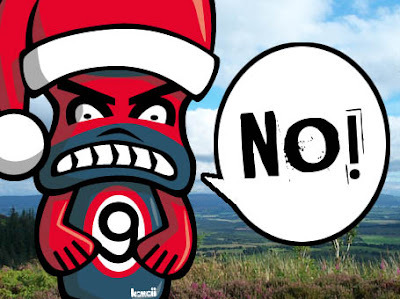 “No!” yelled the Grumpy Mascot, in what I can only assume was disbelief that such a fun filled day out awaited him! “This is ridiculous!” declared the Junior Mascot, undoubtedly in amazement at my wondrous gift! And even the ever serious Serious Mascot was so overcome with emotion, he simply reached up to the heavens and screamed! Absolutely beautiful! All Wrapped Up! Mischief Mascot!